The United States Senate sent a message of solidarity to Israel on Thursday by unanimously passing a resolution that expressed firm support for Israel’s right to protect its people from terrorism on the second day of Pillar of Defense. Sixty-two Senators joined the bipartisan resolution as co-sponsors. The full text of the resolution follows the jump. IN THE SENATE OF THE UNITED STATES Mrs. GILLIBRAND (for herself and Mr. KIRK) submitted the following resolution; which was referred to the Committee on Foreign Relations. When I was a kid, my father used to say “Our greatest hopes and our worst fears are seldom realized.” Our worst fears have been realized tonight. They’ve now said that there were eleven hostages. Two were killed in their rooms yesterday morning, nine were killed at the airport tonight. They’re all gone. Ankie Spitzer, the wife of Andrei Spitzer (z’l), one of the Israeli athletes who came to the Olympics in peace and “went home in [a] coffin,” started a petition calling for a moment of silence during the opening ceremonies for the Olympic Games next Friday, July 27 in London. Over 100,000 people including President Barack Obama have joined Ankie Spitzer in signing this petition. However, the International Olympic Committee has refused to heed these calls. President Barack Obama strongly supports holding a formal moment of silence at the opening ceremony of the Olympic Games in tribute to 11 Israeli athletes and coaches killed by Palestinian extremists at the 1972 games in Munich, the White House said Thursday. ‘We absolutely support the campaign for a moment of silence at the Olympics to honor the Israeli athletes killed in Munich,’ National Security Council spokesman Tommy Vietor told Yahoo News by email. The son of slain Israeli wrestling coach Moni Weinberg, Guri Weinberg, welcomed the news on Twitter. ‘I’m literally crying right now. Thank you, President Obama,’ he said. The International Olympic Committee has rejected the proposal, and said that the victims-killed by extremists of the Palestinian ‘Black September’ group-would be honored at a separate ceremony. In years past, the IOC has said that the Games are no place for what might be seen as a political statement. But supporters of the homage have not given up, and a global campaign has been under way to convince the IOC to reverse its decision. The opening ceremonies begin July 27. The Senate unanimously approved a resolution on June 25 calling on the IOC to hold such a tribute. A similar measure sailed unopposed through the House Foreign Affairs Committee in early June, but it was not clear on Thursday whether the full House would vote on the measure before the games begin. ‘I hope this is the final impetus to get the International Olympic Committee to agree that a minute should be set aside at the Opening Ceremonies next Friday to honor those murdered Olympians,’ said Democratic Representative Eliot Engel. A spokeswoman for Mitt Romney, Andrea Saul, said the Republican standard-bearer had taken no public stance on the issue. Statements from Senator Gillibrand, NBC sportscaster Bob Costas, the Jewish Council for Public Affairs, Canada’s Minister of Foreign Affairs John Baird and Sports Minister Bal Gosal, B’nai B’rith International follow the jump. Observing a moment of silence at the 2012 Olympic Games Opening Ceremony, when the world’s attention is focused on this symbol of international cooperation and peace, would pay tribute to the slain athletes and coaches and would send a powerful message of unity in the fight against terrorism. I intend to note that the IOC denied the request. Many people find that denial more than puzzling but insensitive. Here’s a minute of silence right now. The Olympics are a globally anticipated event celebrating human achievement and spirited competition. But one tragic morning in 1972, that celebration was horrifically interrupted as 11 Israeli athletes in Munich for the games were kidnapped and ultimately killed by a group of Palestinian terrorists known as Black September. In the years since, the families of these victims have been looking to have the memories of their loved ones – who came to Munich in the spirit of peace – honored at the Olympic opening ceremony with a simple moment of silence. But they have been continually rebuffed. Now a campaign led by one of those family members has attracted over 90,000 signatures to a petition asking the International Olympic Committee for a moment of silence to remember the murdered Israeli athletes. The terrorist attack targeted not only Israel, but the spirit and goals of the Olympic movement…it should be marked publicly as part of the official ceremony. B’nai B’rith has signed Spitzer’s online petition-which currently has nearly 97,000 signatures-to encourage the IOC to hold the minute of silence and praises countries such as the United States, England, Australia, Belgium and Germany for supporting these efforts. As Congress debates the reauthorization of the Violence Against Women Act — which has been passed and reauthorized with bipartisan support several times since it’s inception in 1994 — prominent Democrats marked April 17 as “Equal Pay Day,” recognizing the importance of continuing to fight for gender equality in the workplace. Several leading Democrats issued statements and penned op-eds in order to raise awareness of the issue, as well as the larger fight for women’s rights. President Obama and Democrats understand that equal pay is so important for women and their families that one of the first pieces of legislation Democrats passed in 2009 and the first bill the President signed into law was the Lilly Ledbetter Fair Pay Act. The Lilly Ledbetter Fair Pay Act ensures that women can fight for equal pay for equal work, and on National Equal Pay Day we celebrate our continued fight for economic equality, regardless of gender. The President’s commitment to women is in stark contrast to Mitt Romney and the GOP’s attitude toward equal pay for women. While Democrats and the President were making equal pay for equal work a priority, nearly every Republican in the House and Senate voted against the Lilly Ledbetter Fair Pay Act; Wisconsin Governor Scott Walker, who Mitt Romney has called a ‘hero,’ recently repealed that state’s fair pay law; and Mitt Romney refuses to say if he would have signed Lilly Ledbetter had he been president at the time. His campaign on a conference call last week couldn’t even articulate a response when asked his position on the law…. On Equal Pay Day women can rest assured that Democrats and President Obama will continue the fight for equal pay for equal work and will fight for their right to make health care choices for themselves and their families. It’s a shame that Mitt Romney and Republicans can’t say the same thing. I’m proud of the accomplishments of the Democratic-led Congress on behalf of equal pay and fairness. The Lilly Ledbetter Act-the first bill President Obama signed into law-restored the right of women and other workers to challenge unfair pay in court. Further, under the Affordable Care Act, soon women will no longer be charged higher premiums than men for the same coverage and no longer will being a woman be treated as a pre-existing condition. On Equal Pay Day, we honor all of our nation’s women, who through their labor – at home and in the workplace – have made our country strong. And we recommit to opening the doors of opportunity for the next generation of women. 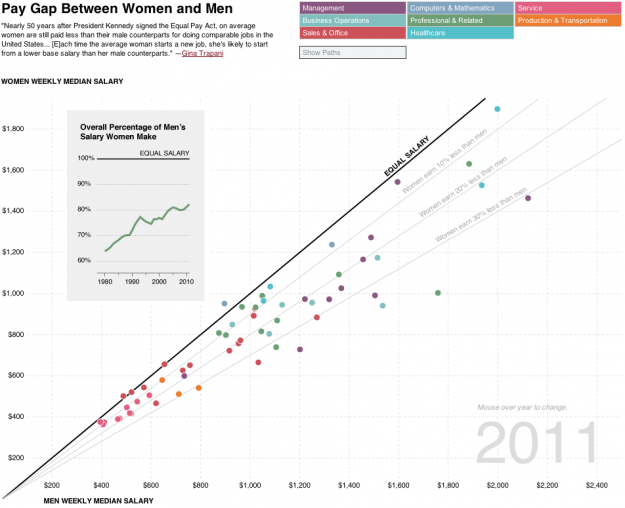 Graph of pay gap by profession, a map of pay gap by state, and op/eds by Senators Gillibrand and Boxer follow the jump. …[T]he issue of pay equity is not merely one of fairness. Equal pay for equal work is vital for our economic growth and middle class financial security. With more and more women contributing to household incomes, the lack of equal pay for women hurts all middle class working families-men and children included. In New York alone, women head more than 1,000,000 households. It’s estimated that because of the wage gap, New York families are deprived of $8600 a year. Nationwide, it’s been estimated that if women were paid a dollar on the dollar for equal work, the U.S. GDP could grow up to 9 percent. In addition to being an economic security issue, the failure to pay women a salary that’s equal to men for equal work is also a women’s health issue. The fact is that the salary women are paid directly impacts the type of health care services they are able to access for both themselves and their families. For example, if we closed the wage gap, a working woman in New York would be able to afford more than 2 years worth of additional family health insurance premiums. At a time when women’s health services are increasingly vulnerable to budget cuts, it’s more important than ever that women have financial security to maintain access to basic care for them and their families. Suppose it’s the championship basketball game and one player is committing foul after foul. Each time, he denies he’s committed any offense. Eventually, he fouls out. But even as he heads to the bench, he’s protesting that he did nothing wrong. That’s what we’re seeing today from Republicans who claim there is no ‘war on women.’ The Republican National Committee chairman likened it to a ‘war on caterpillars.’ The Senate Republican leader claims it’s all manufactured – even as female members of his caucus warn about the growing backlash against the GOP from women. House Republicans have introduced more than 30 bills that would restrict a woman’s reproductive health care. Those same Republicans, who decry an all-too-powerful government, have no problem deciding what health care is right for our daughters, or sisters or mothers…. Here in Congress, 116 Republicans in the House and 19 Republicans in the Senate are co-sponsors of ‘personhood’ legislation, which would criminalize abortion with no exceptions for the mother’s life or health. … It could even bar doctors from providing life-saving care to women with dangerous ectopic pregnancies. It doesn’t end there. Republicans in Congress blocked an international treaty – the Convention on the Elimination of All Forms of Discrimination Against Women – even though the only other nations refusing to ratify it are Iran, Sudan, South Sudan, Somalia, Palau and Tonga. They also oppose increasing the minimum wage – when women make up about two-thirds of all workers now earning minimum wage or less. Not one Republican is a cosponsor of the Equal Rights Amendment. Republicans voted against the Violence Against Women Act, which helps protect women from domestic violence, when the bill was in the Senate Judiciary Committee. They voted to repeal the health care law – including the part that says no more gender discrimination in the pricing of health insurance policies and the part that offers free preventive services like mammograms, STD screening, well-woman visits and birth control. The facts are the facts. The Republicans have launched a war on women. Despite all the denials, women get it – and so do the men who care about them. Several prominent Jewish organizations have also spoken out in favor of VAWA’s reauthorization. The Jewish Council for Public Affairs, National Council of Jewish Women, the Religious Action Center of Reform Judaism, and Hadassah have all urged their supporters to contact their local Congressional delegations and urge that they vote to pass the reauthorization of VAWA immediately. This is too important to wait. Click here to read Senator Gillibrand’s entire op-ed. Click here to read Senator Boxer’s entire op-ed. Click here to read about how President Barack Obama’s actions have reflected Jewish values, including his accomplishments on women’s rights.